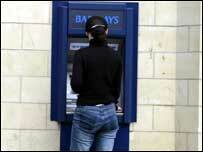 A bank has admitted a cash point blunder gave customers double their money. Queues formed at Barclays bank in Wooler, Northumberland, when word spread the ATM was dishing out £20 notes instead of £10 notes. The mistake is being blamed on a wrongly-loaded cash cassette in the dispenser, which was provided by another company. The bank says customers who were given the cash will not have to pay it back. The cash cassette was loaded with £20 notes when it should have contained £10 notes. Customers using debit cards which have a £200 limit on cash machine withdrawals suddenly found it was paying out £400 on 21 April. Within hours the machine had been emptied. Bank officials were alerted by one customer who reported the additional payout. The problem cassette was immediately replaced. A Barclays spokeswoman said the bank would be seeking compensation from the company which installed the cash cassette. She said: "On this occasion we will not be asking customers to pay back any money they were issued by the machine. "This is a very rare occurrence and was not the responsibility of Barclays. "We will be seeking compensation from our third party partner." In a similar incident, scores of customers swooped on a Halifax Bank dispenser in Urmston, Greater Manchester after it began giving out an extra £20 with each transaction. It is thought up to £65,000 may have been emptied from the machine in 12 hours during the cash bonanza on Tuesday night. Staff discovered the glitch when they turned up for work on Wednesday and immediately switched the machine off.